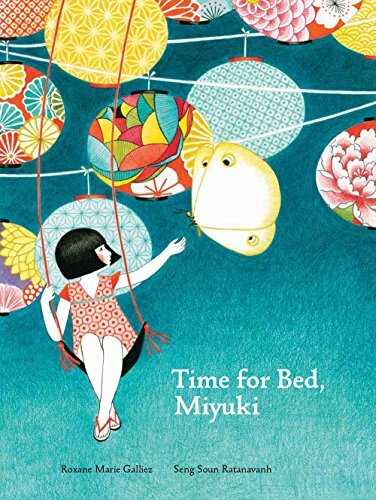 Time for Bed, Miyuki is a visually stimulating book that suspends time for just a few moments. It prolongs the routine bedtime ritual, morphing it from mundane habit into festive and pleasant inspiration. Miyuki is a bright young girl living deep inside her own imaginative world. It is a fantastically grand world of gigantic flower blossoms, human sized dragonflies, a ladybug bigger than a foot, and a toad that fills the water bucket with its girth. It is a magical place where an energetic girl can catch a ride on a kite, strut through her garden on pencil stilts, and dance gracefully over mushroom tops. All of which must be accomplished, according to Miyuki, before she will even think about getting ready for bed. In her young mind, Miyuki believes that the Dragonfly Queen, and her entire court, will be visiting her garden in the morning. Many tasks must be tended to in royal preparation: make a canopy, water the vegetables, corral in the snail family for the night, and cover up the cat in a warm cozy blanket. Each task is of paramount importance. Miyuki’s grandfather, sensing her insistence, takes direction obediently and humors Miyuki in all her wishes. One gets the impression that kind and patient grandfather has been through all of this with Miyuki many times, many nights, before. Even when Miyuki has run out of her curious scope of chores to complete, she stalls further with her regular bedtime routine. She takes a bath in a steamy tea cup, insists on selecting her best kimono-style pajamas, directs grandfather to brush her smooth black hair, and gets tucked lovingly into the most interesting bed: a red slipper custom fit for Miyuki’s personality. Finally, grandfather reads the evening’s story selection and Miyuki succumbs. Illustrator Ratanavanh utilizes patterns, combined with a limited red-blue-yellow palette, to assemble each inventive scene. The natural objects that surround Miyuki become a fantasy that mimics her larger than life visions. Proportions are distorted in a scale that shifts the focus far away from any normal sense of reality. Dominating the pages is Miyuki’s version of her make-believe story. There is vivacious movement from page to page but also a satisfying and pleasing Japanese design aesthetic. Galliez’s writing style is gentle and poetic. She pairs creative verbal imagery with repetition. Miyuki regularly makes tender statements like, “Oh, Grandfather, we must dance the last dance of the day, to thank the sun for shining so nicely.” While Grandfather is mostly restating the checklist of all the tasks Miyuki has completed which surely, as they keep accumulating, must by now have worn her out. The story twist at the end pulls the reader in, inviting them to participate with Miyuki in her sweet, sassy, spontaneous and immediate imagination. Having been privileged to witness the inner workings of Miyuki’s dream, the story begins anew and the reader will cycle around to start the first page all over again. Which is, most likely, what Miyuki will subject her grandfather to once more during tomorrow’s inevitable bedtime give and take when, perhaps, she will feel compelled to prepare for the arrival of the Koi Pond Prince, The Lotus Blossom Wizard, or some other such fancy. Time for Bed, Miyuki contains the type of rich and vibrant pretend play-life one hopes is inherent in every child.